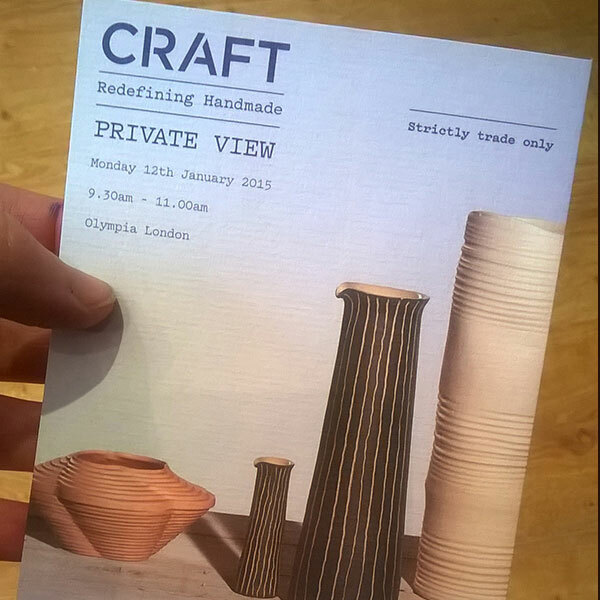 I nipped out of the studio yesterday to catch the Craft: Redefining Handmade trade show for 2015. It’s been quite a while since I’ve done any trade shows due to some not inconsiderable exhibition fatigue on my part and having too many other things going on, so it seemed high time to go and get myself back in the swing by visiting. This is the second year of Craft which started in 2014 as a kind offshoot of the Top Drawer / Home trade show. Last year this triumvirate of trade shows was held at the doomed Art Deco sprawl that was the Earls Court Exhibition Centre which is currently being demolished for yet another London ‘quarter’ to be built in its place. Last year the Craft show had been wedged between a pretty awful Top Drawer fashion section and the more exciting Home show. It felt a bit of a hotchpotch and not terribly inspiring, but it was the first attempt by Piyush Suri of Handmade in Britain at putting on a Clarion show. So I wasn’t expecting too much when I popped in but in its new location in Olympia, Craft seemed a much more confident show. Clarion had assigned it a reasonable space upstairs off the balcony area and it felt intimate without being overwhelming. By contrast Home, the affiliated trade show located downstairs in the main space, felt characterless and corporate and there were some makers there who were probably kicking themselves that they hadn’t switched to Craft. However I would take issue with Craft‘s flyline – ‘Redefining Handmade’…. unless Piyush is intending to redefine handmade as things made to look like everything else! Three exceptions to this were the work of two makers I know and one I don’t but I like. 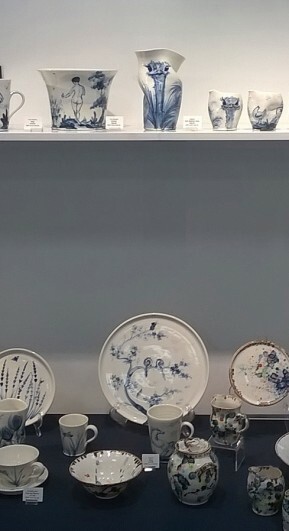 The first, Mia Sarosi, was one of our artists for Designed | Crafted and makes porcelain pieces. Her newest work is an exploration of the assumptions of the making process. For example, she deliberately works with over-soft clay to produce tactile, undulating surfaces on which to paint her designs. It was good to catch up with Mia and find out how successful the show had already been for her. The second, Nicholas Collins, was a glass artist that I was with at Central Saint Martins ten years ago, whom I haven’t seen since, so we had a lot of catching up to do! 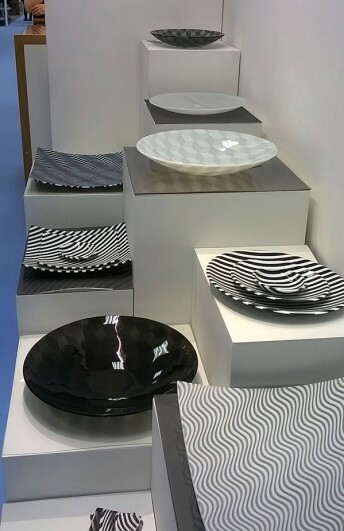 However Nick’s work preceded him as I’d admired his sleek monochrome pieces online. Seeing them in real life was even better, and his newest piece literally appeared to vibrate with energy and had the same curious optical effect as a Bridget Riley. And after all that understated monochrome, I got my colour shot from the stand by Fanny Shorter. 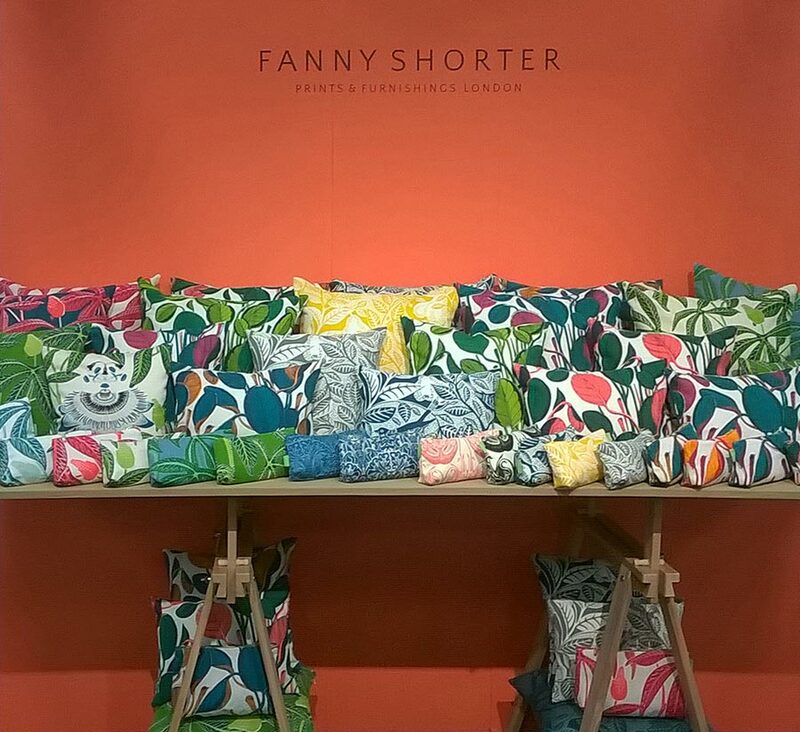 She’s not a designer I had known about, but I loved her stuff and reading more about her on her website, I could see why – her cushions, prints and homewares are clearly influenced by her very English upbringing and childhood visits to the V&A and the Natural History Museum. The Arts and Crafts influence that I love is clearly there but done in a vibrantly contemporary style. I was more impressed with Craft: Redefining Handmade that I thought I’d be, so I think I’ll be a new recruit for next year.